The renaissance of Matthew McConaughey’s career over the past few years after a series of poor rom-coms in the mid-00’s led to some fantastic performances and some fantastic films, so that perhaps affects expectations for each new release. This is probably his stickiest patch since the critical praise and awards that came with performances in the likes of ‘Dallas Buyer’s Club’, ‘True Detective’ and ‘Mud’, with ‘Free State of Jones’ and now ‘Gold’ both receiving lukewarm reviews. 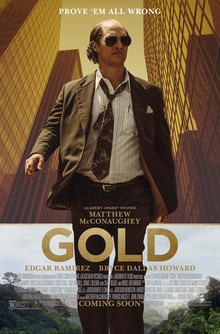 Certainly with ‘Gold’, its release date suggests the filmmakers and producers had the Oscars in mind, and whilst ‘Gold’ isn’t of that standard, I still found it to be a fun and entertaining watch, largely down to McConaughey’s performance. Truth be told, it’s not McConaughey’s finest recent performance and his turn as Kenny Wells is a little over the top and full of scenery chewing. The character is written like a caricature and McConaughey fully embraces that, and for me, he was very watchable and entertaining. The story itself doesn’t give him much to work with and it’s not particularly original, even in recent times with films such as ‘War Dogs’ and ‘The Wolf of Wall Street’ capturing the essence of the rise and fall narrative. Our lead character, Kenny Wells, is a gold prospector with a failing business, who decides to invest his savings on a punt to try and find gold in the middle of the Indonesian rainforest. He’s helped by a local geologist, Michael Acosta, who’s played well by Edgar Ramirez. The film follows the hunt for the gold and the subsequent fallout when the digging team discover it, as Wells becomes a multi millionaire overnight and embraces the worst excesses of the hedonistic lifestyle he’s now able to afford. As I mentioned previously, the film lacks the originality to be truly entertaining and it hits most of the beats you’d expect with its narrative, with only McConaughey’s fun performance elevating the material. I think ‘Gold’ suffers from a lack of punch so to speak, and it’s safe and straightforward storytelling prevents the film from really bursting into life, and despite moments of humour dotted throughout, it lacks consistent laughs as well. It does have a cracking soundtrack though! It’s based loosely on a true story and I suspect that perhaps hindered the filmmakers, but I don’t think ‘Gold’ is as bold as it could have been and that’s disappointing. ‘Gold’ features a typically committed performance from latter day Matthew McConaughey, but even his presence can’t spark ‘Gold’ into life, and whilst I did enjoy the film, there’s a feeling that we’ve seen this all before, and better.